Still waiting on a 2TB model. That's not to say the MX300 line is slow—it boasts rated read speeds of up to 530MB/s and write performance of up to 510MB/s, and Crucial says that's true of all file types. Compared to the growing number PCIe-based SSDs entering the market, those performance metrics won't knock anyone's socks off, but they're on the upper end of what's available in the SATA 6Gbps category. Crucial also touts a high level of endurance. Courtesy of Micron's 3D NAND technology, Crucial claims its MX300 SSDs can endure up to 220TB of written data. Other features include AES 256-bit hardware-based encryption support, RAIN technology (an enterprise-class feature that disperses data on multiple storage components in case a particular section fails), adaptive thermal protection, and a data defense feature that Crucial says protects files from becoming corrupted. All of those work out to around $0.25 to $0.26 per gigabyte. Not bad all around, though if you're looking for a 1TB-class SSD solution, there are less expensive options, such as the Silicon Power S55 960GB ($210), PNY CS1311 960GB ($220), SanDisk Ultra II 960GB ($230), Mushkin Reactor 1TB ($235), SanDisk X400 1TB ($248), and OCZ Trion 150 960GB ($250). 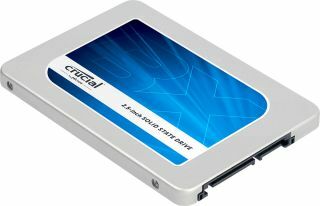 Crucial also plans to release a 2TB capacity MX300 SSD at some point, though it hasn't said when that will happen.